Congratulations to Ryan Hoffman for achieving the highest rank a Boyscout can get! There’s a monumental amount of work involved in getting Eagle that takes years of a boy’s adolescence, so it’s great he’s managed to make it. This entry was posted in Eagle Scout. Bookmark the permalink. 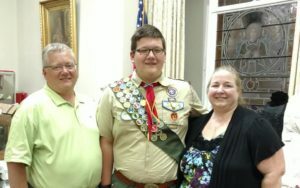 ← Troop 223’s 76th Eagle Scout, Tyler Waite!